IMAGINE, The Age of Aquarius project is a moss mural relief sculpture installed on the adjacently owned building from the new Millvale Community Library. 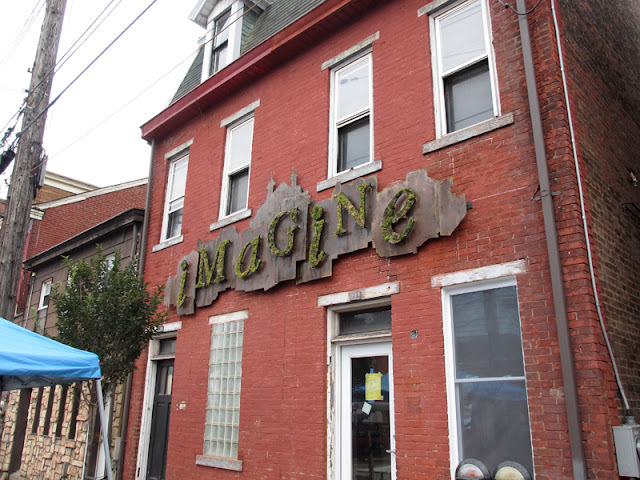 The design incorporates the word, “IMAGINE” in relief over the Pittsburgh skyline seen from the outlying community of Millvale. This “green” mural, concept is to generate hope and positive change in a depressed area in Pittsburgh, where 14.1% live below the poverty line, and 70 % of the population live in middle to lower income households. I have incorporated eco-art within my artwork collectively and individually. I, along with 12 students in my eco-art class within the studio arts department at the University of Pittsburgh worked diligently to realize this installation. Historically, economically an environmentally depressed areas plagued with environmental injustices which include in this case ongoing flooding with no federal support, are not exposed to the healing influence of the arts or conversations about ecology or the power of creativity. Using art towards environmental change as with the moss mural relief sculpture works to engage the community of Millvale PA in a conversation regarding ecological issues. This non- profit community Library is already a focal point for the emerging consciousness of the neighborhood. Because the library is located on Main Street, the moss mural becomes a prominent landmark in Millvale and furthers the conversation that connects imagination with the idea of a communal ecological consciousness. The word "Imagine" is the central icon of the mural which is out of the living matter of moss, metaphorically conveying to the viewer the potential for the community to be realized as a fertile, green, growing, healthy environment. The skyline is constructed from mild steel, representative of Pittsburgh’s roots in the steel industry that have long been a cornerstone of cultural and economic history in the region.